Fitbit is a big name in the fitness tracking market, and this is mainly due to its charge series of trackers. 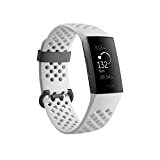 Categorized as mid-range offerings, the charge series might lack smartwatch functionality but they still have a lot to offer in terms of features and smartphone connectivity compared to entry level Fitbit Alta HR and Fitbit Flex 2. The latest addition to Fitbit’s flagship fitness trackers, the Fitbit Charge 3, is designed to help you understand your body and health in general. With a 24/7 monitoring and recording of your activities, you get an updated report of each day’s performance. The watch measures the number of calories burned, your heart beat rate and the number of hours you are active. It comes in a stylish design that is comfy and durable too. Its extended lasting battery and waterproof capability make you worry less about its adaptation to the environment. The Fitbit Charge 3 is designed for athletes who want to monitor their progress as they work towards keeping fit. It corrects the shortcomings of its predecessor, Fitbit Charge 2. Improvements like swipeable touchscreen, improved battery life and added water resistance are vital for everyday use. With numerous other unique features that comes along with it, the Fitbit Charge 3 is a must-have for athletes and all those who want to take a more considered approach to their fitness. Keep reading to see what the Fitbit Charge 3 has to offer. With the 15+ exercise modes to choose from, you aren’t limited to what you can do with this smartwatch; running, cycling, swimming, yoga and circuit training are some of the activities you can track. Not even fierce water waves can prevent this device from working under water. Its waterproof ability allows it to work 50m below water. You also don’t have to take it off while in the shower. Fashion was not left behind with the Fitbit Charge 3. Its sleek and stylish design is the heart of it all. You can change the band and choose one that best suits you according to your preference. The Fitbit App is compatible with over 200+ iPhone, Android and Windows devices. Texts, receive calls, get updated notifications and look through the weather forecast at the comfort of your Fitbit device. Your phone device ought to be near in order to achieve this bit. The Fitbit Charge 3 comes in a quick and highly responsive touchscreen that displays all contents clearly. The OLED-based display is now 40 percent larger, with increased brightness and sharpness ideal for outdoor use. On top of that, it automatically adjusts to the lighting conditions of the environment. You are able to view notifications, stats and the time in both broad daylight and night-time. The Charge 3 is programmed to recognize when you’re working out automatically and the activities you are involved in. There’s automatic exercise detection for activities like running, swimming, and cycling among others. This means that you can just set off without worrying about starting a new workout manually. In addition, it monitors and records your progress in the Fitbit App. Depending on your use, the Fitbit Charge 3’s battery is able to last up to seven days on a single charge. This relieves you the burden of carrying your charger every time and enables you to continue with your workouts with no worries. It is worth mentioning that at night time, the smart watch is fully operational monitoring your sleeping patterns. The Fitbit Charge 3 is water resistant up to 50 meters below the water and features swim tracking. This is arguably the most significant change in aiding this model’s ever-presence. Every time you take your fitness tracker off, there’s a chance you won’t put it back on. Fitness Charge 3 will help you develop a routine of actually wearing it. You don’t have to take it off while to take a shower or a casual dip in the swimming pool. The Charge 3 is compatible with numerous third-party apps. It can synchronize automatically and wirelessly to 200+ Android, Windows and iOS devices. The App allows you to a lot of things; set everyday goals, track your progress, and get occasional updates about your health. Also, the Fitbit pay will enable you to make easy and secure transactions by loading your cards to your wallet in the Fitbit App. Basically you are able to do almost everything you can do with your smartphone. Stay connected when your phone is nearby. Like its predecessor, the Charge 3 can mirror your smartphone notifications straight to your wrist. Receive calls, texts, replies, calendar alerts and App notifications instantly. You are also able to send responses to Android devices. The notifications take advantage of the improved display to allow more text to be shown on the screen. Every activity and little detail that is related to you are recorded. These include the distance covered, number of steps taken, the number of floors climbed, how long you’ve been active, and the number of calories burnt. The addition of the Sp02 sensor in Charge 3 works alongside PurePulse heart rate monitor to monitor your blood oxygen levels. The purpose of this is to show how each day impacts your life. For women, this is a heaven-sent device. Your health is closely and carefully monitored. It assists you in understanding your body better. Your periods, ovulation calendar and symptoms are all tracked. Fitbit Charge 3 provides you with personalized and guided breathing sessions to help in monitoring your heart rate. During your day and workouts, it provides you with moments of calm and checking on your breathing speed. The smartwatch is made of aerospace-grade aluminum that is light, durable and long lasting. Its Gorilla Glass 3 casing is smooth making the device comfortable and also durable. The Cardio Fitness Level gives you a score on how you have performed based on the data collected. It helps give you an understanding of your current fitness level and the way forward in improving with time. You aren’t stuck with one clock face with the Fitbit Charge 3. There are numerous stylish clock faces to choose from all dependent on your taste and preference. This model allows four different designs. Fitbit have consistently provided their loyal customers with a wide range of quality and high performing devices for their fitness. The Fitbit Charge 3 is a great all-rounder – easy to use, stylish and versatile machine designed to meet all your workout needs. It does everything you’d expect from a great fitness tracker and supports both Android and iOS devices. With all the Apps and cool features available, you will enjoy every moment of your fitness journey. Looking for more? Check out a review of the powerful Fitbit Versa!